And how’s his ability to stay on the bike? Because those are surely the only things that can prevent him from winning this year’s Tour de France. Never mind stopping for a pee, Froome could take a crap (even a challenging, low fibre crap) and still conceivably retain the yellow jersey. If he falls, or fades in the third week, things could perhaps change, but that’s really all his rivals have got to hope for now. Froome gained 1m04s on Nairo Quintana, 2m30s on Tejay Van Garderen, 2m51s on Alberto Contador and 4m25s on Vincenzo Nibali. There are two reasons why these gaps are so large. In the cases of Contador and Nibali, it’s because they weren’t much cop. Neither made the top ten. Both were beaten by Gallopin’ Tony, who up until today was still thought of as being more of a sprinter than a climber. The second reason was perhaps because it was such an intense effort. As the first climb of the Tour, some of the riders’ climbing muscle fibres will have been (relatively) fresh and nor were there any mountains earlier in the stage to take the edge off. It seems counterintuitive, but a harder stage might have dulled Froome’s top end efforts, bringing everyone to a closer level. So if Contador and Nibali weren’t in the top ten, who was? Working our way down, Richie Porte was able to draft Quintana while he was chasing Froome, conserving just enough energy that he was able to nip out and nick the second place time bonus at the end like a complete sod. Robert Gesink somehow failed to finish 15th, while Alejandro Valverde also beat many of the more fancied riders. 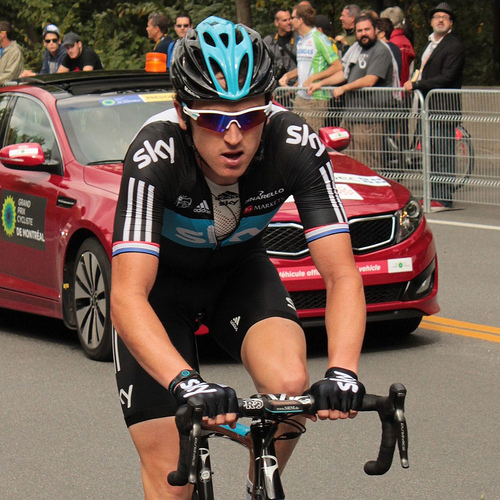 Geraint Thomas in sixth and Adam Yates in seventh – three Brits in the top ten! There are then a few additional catastophes worth noting outside the top ten. I mean obviously pretty much everyone had a bad day, but these are the real downers. Jean-Christophe Péraud, second overall last year, lost 5m38s. Rigoberto Uran lost 5m54s. Joaquim Rodriguez lost 6m07s. Romain Bardet lost 8m50s. Thibaut Pinot, third last year, lost 10m03s. It was pretty obvious that Pinot’s head had gone last week. A few vital organs must be departing as well now. How can Team Sky be so strong? Each year, the Tour de France’s Big Mountain Sort-Out also coincides with World Cynicism Day (or perhaps World Naivety Day, depending on your perspective). This year, the big question is how can Team Sky be so strong? With three riders in the top six, it’s certainly a striking performance. Cycling fans have had some pretty spectacular tales of naughtiness to take in over the years, but when it comes to conspiracies, I’m always inclined towards a view that the truth is generally a lot more boring than you imagine. Before drawing dramatic conclusions, remember that Sky have one very obvious advantage over almost all the other teams. Marginal gains? What about profit margins? The team has flashed the cash and bought and retained many of the strongest riders in the peloton. Nicolas Roche has two top six finishes in the Vuelta a Espana and I would estimate that he is Sky’s sixth or seventh strongest climber. Peter Kennaugh is the British national champion reduced to doing donkey work. Leopold Konig has never finished outside the top ten in any Grand Tour in which he’s taken part and he’s carrying water bottles. Is it really so unbelievable that Richie Porte should finish second on the stage? He’s been the UCI’s top-ranked rider most of the year and is fresh as a daisy having spent the first week of the race dicking about at the back, losing 45 minutes on Froome and the other frontrunners. And Froome himself? Well presumably he’s team leader for a reason. A good Colombo-style final word – or at least it would be if I weren’t about to preview the next stage. So just one penultimate thing; a little flashback to suggest that this stage might not prove quite so decisive as I have thus far led you to believe. On the first mountain stage of the 2013 Tour, Chris Froome and Richie Porte finished first and second while the man who eventually finished second overall, Nairo Quintana, lost 1m45s. The very next day – the very next day – Team Sky imploded and Froome was left isolated for 130km of a 160km stage. He survived, but to underline the point that fatigue builds even for the guy who looks far superior to everyone else on the first proper climb of the race, Froome eventually lost time to Quintana on stages 18 and 20. Bike races are long. Grand Tours are longer. 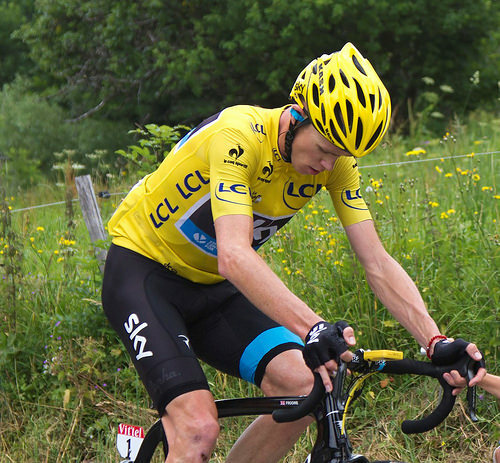 Chris Froome has shown how fast he can go, but the Tour de France is also about how tired you get and there are, quite literally, many, many mountains to climb before Paris. With climbing legs now engaged, the riders tackle the first category Col d’Aspin before the Col du Tourmalet, which I’m pretty sure is the highest point in this year’s race. Here’s the profile. If you’re waiting for a repeat of the Sky implosion I referred to above, stage 12 is probably more likely. That’s Sky implosion with an upper-case S, by the way, not sky implosion, which surely no-one would wish for. Who’s the fastest climber in the peloton?